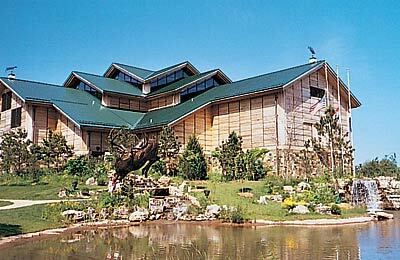 The American National Fish and Wildlife Museum was the main reason we decided to take a short vacation to Springfield, Missouri. This impressive attraction is as fun as it is educational. We couldn't believe the wide range of interactive exhibits packed into two floors, including a large aquarium… a walk through a forest… a bobcat habitat… a saltwater touch pool… and a beaver pond. My youngest child had a blast “catching” a huge swordfish at a fishing simulator. And we were fascinated by the sharks roaming the aquarium; we learned that they're overfed to keep them from eating other fish! Springfield is in southwest Missouri, where I-44 meets U.S. Highways 60 and 65. The museum (500 W. Sunshine St.) is open 9 a.m. to 6 p.m. daily, except Christmas Day. Admission is $9.95 for adults and $6.25 for children ages 4-11; a family pass is $29.95. For more information, call 1-417-890-9453 or log on to www.wondersofwildlife.org.